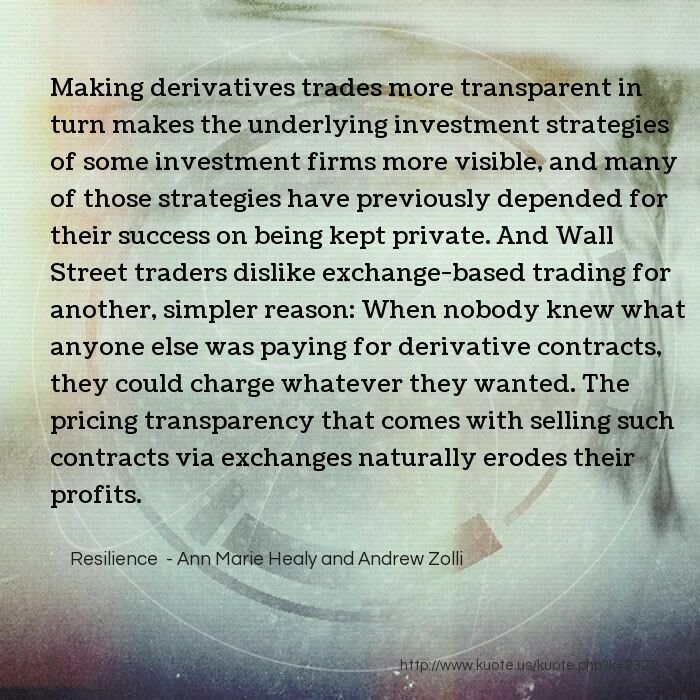 Making derivatives trades more transparent in turn makes the underlying investment strategies of some investment firms more visible, and many of those strategies have previously depended for their success on being kept private. And Wall Street traders dislike exchange-based trading for another, simpler reason: When nobody knew what anyone else was paying for derivative contracts, they could charge whatever they wanted. The pricing transparency that comes with selling such contracts via exchanges naturally erodes their profits. 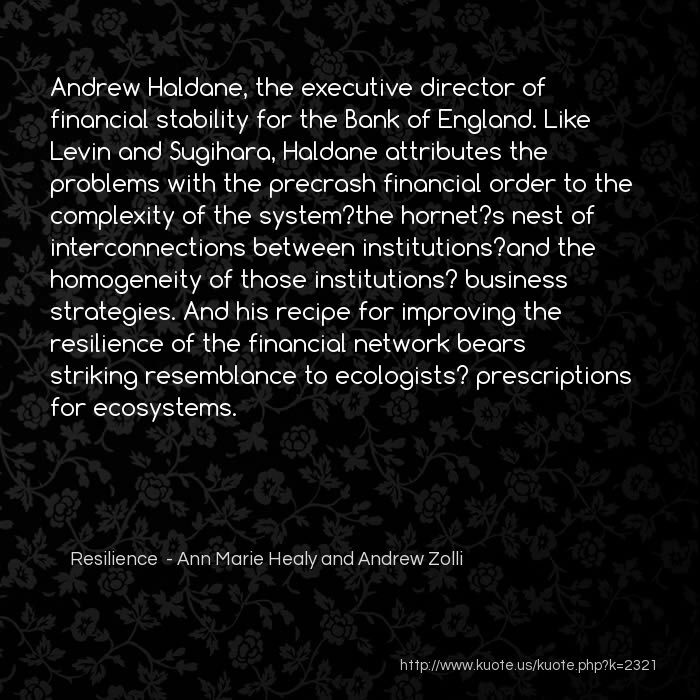 Andrew Haldane, the executive director of financial stability for the Bank of England. 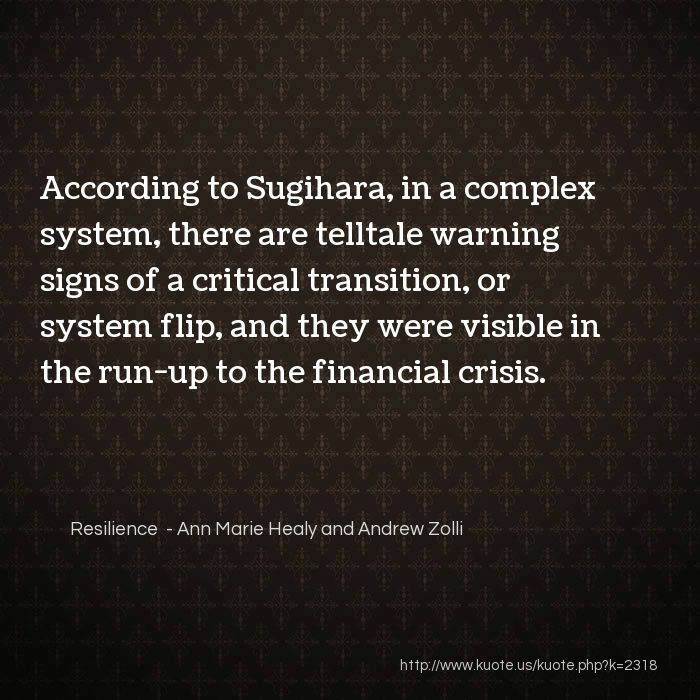 Like Levin and Sugihara, Haldane attributes the problems with the precrash financial order to the complexity of the system?the hornet?s nest of interconnections between institutions?and the homogeneity of those institutions? business strategies. 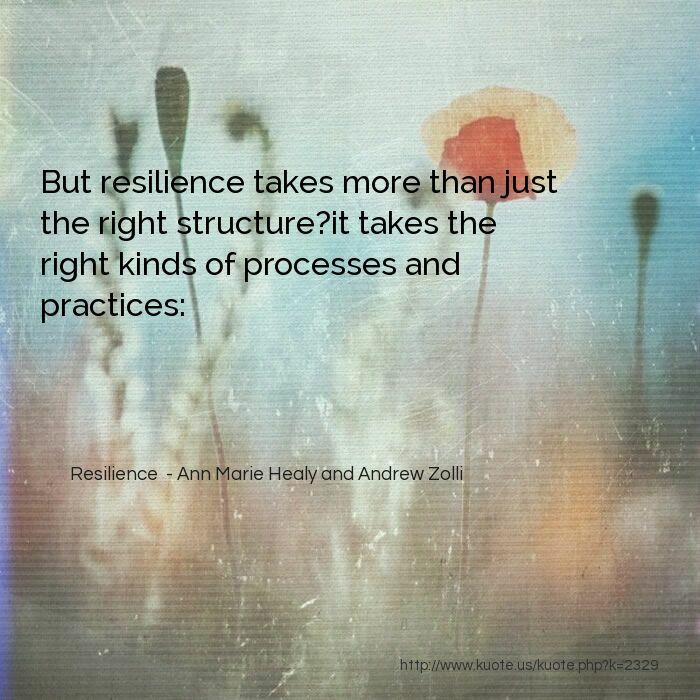 And his recipe for improving the resilience of the financial network bears striking resemblance to ecologists? prescriptions for ecosystems. 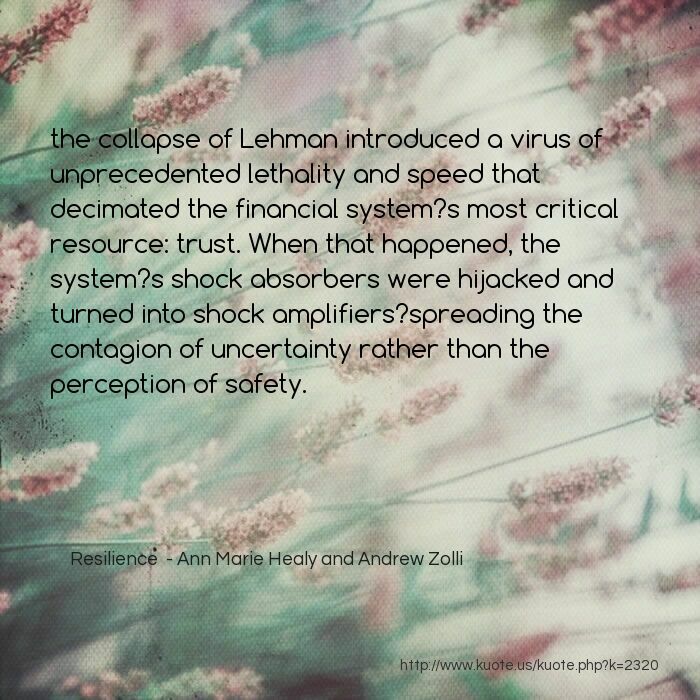 the collapse of Lehman introduced a virus of unprecedented lethality and speed that decimated the financial system?s most critical resource: trust. When that happened, the system?s shock absorbers were hijacked and turned into shock amplifiers?spreading the contagion of uncertainty rather than the perception of safety. Just before such destabilization occurs, a system paradoxically may experience synchrony, as agents within it briefly behave in lockstep just before being thrown into chaos. 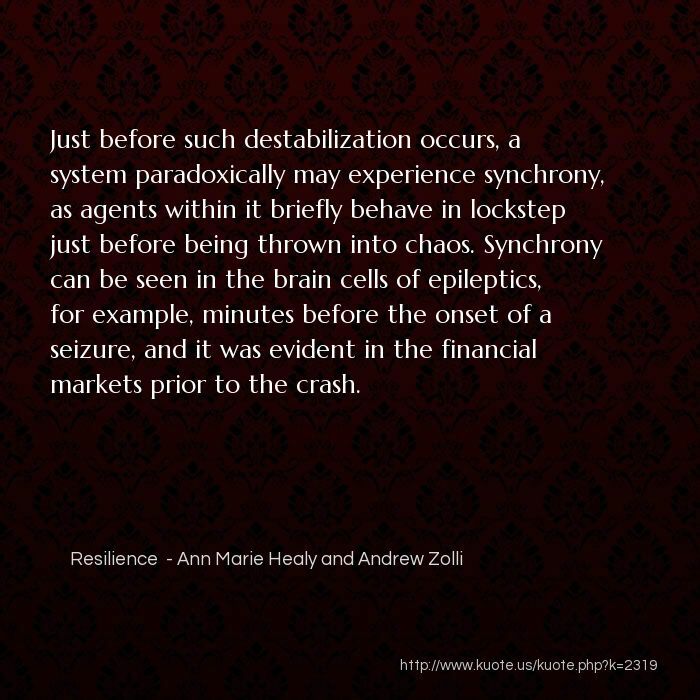 Synchrony can be seen in the brain cells of epileptics, for example, minutes before the onset of a seizure, and it was evident in the financial markets prior to the crash. After the crash, figuring out who owed what to whom wasn?t just hard, it was impossible. 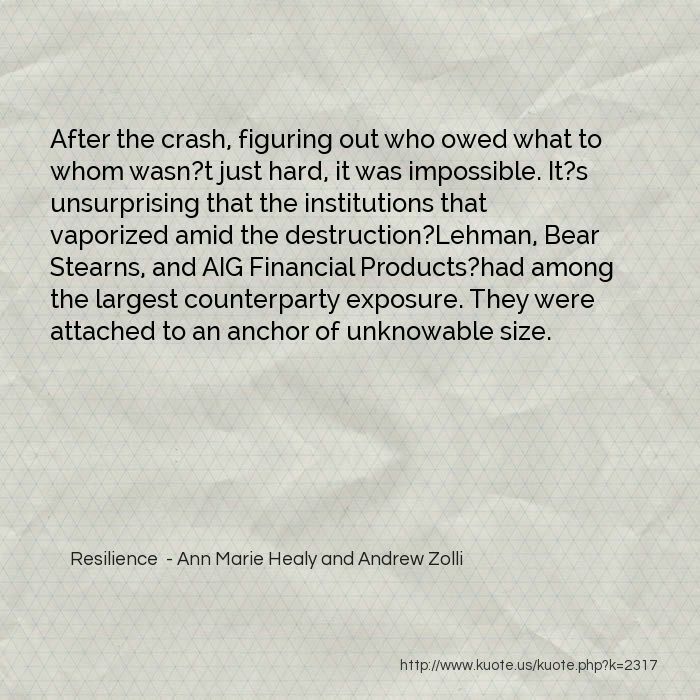 It?s unsurprising that the institutions that vaporized amid the destruction?Lehman, Bear Stearns, and AIG Financial Products?had among the largest counterparty exposure. They were attached to an anchor of unknowable size. 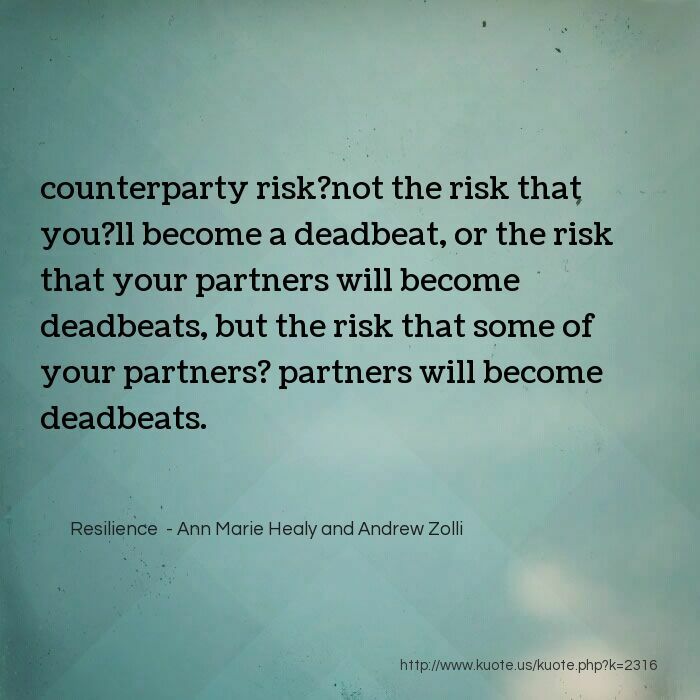 counterparty risk?not the risk that you?ll become a deadbeat, or the risk that your partners will become deadbeats, but the risk that some of your partners? partners will become deadbeats. 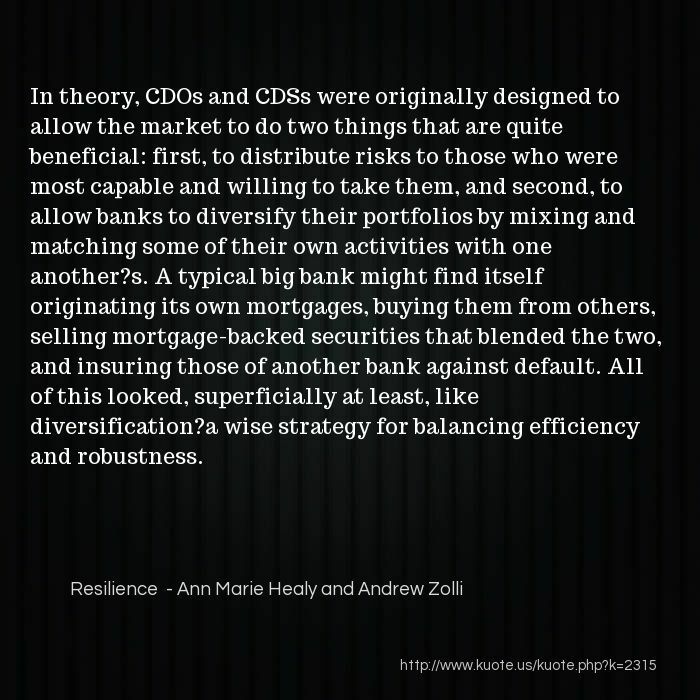 In theory, CDOs and CDSs were originally designed to allow the market to do two things that are quite beneficial: first, to distribute risks to those who were most capable and willing to take them, and second, to allow banks to diversify their portfolios by mixing and matching some of their own activities with one another?s. A typical big bank might find itself originating its own mortgages, buying them from others, selling mortgage-backed securities that blended the two, and insuring those of another bank against default. All of this looked, superficially at least, like diversification?a wise strategy for balancing efficiency and robustness. 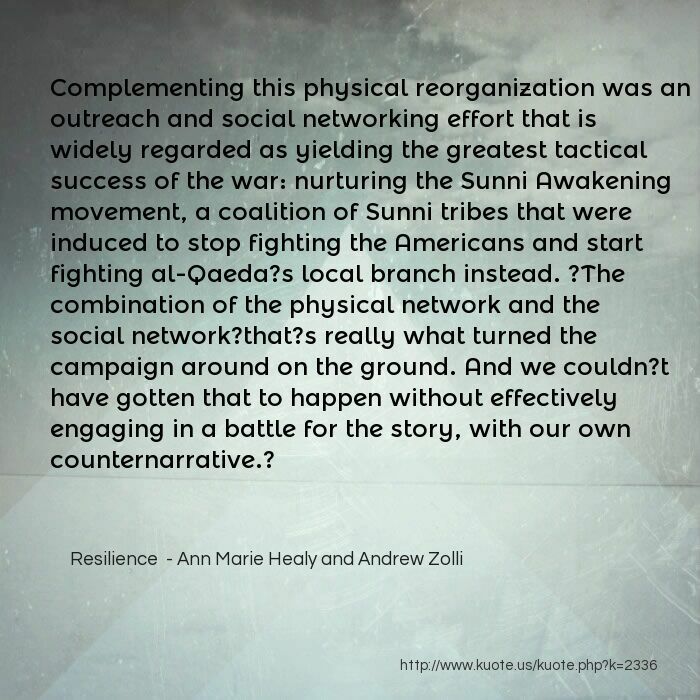 Complementing this physical reorganization was an outreach and social networking effort that is widely regarded as yielding the greatest tactical success of the war: nurturing the Sunni Awakening movement, a coalition of Sunni tribes that were induced to stop fighting the Americans and start fighting al-Qaeda?s local branch instead. ?The combination of the physical network and the social network?that?s really what turned the campaign around on the ground. And we couldn?t have gotten that to happen without effectively engaging in a battle for the story, with our own counternarrative.? A modest 2-centimeter granuloma alone can contain 100 million active bacteria. 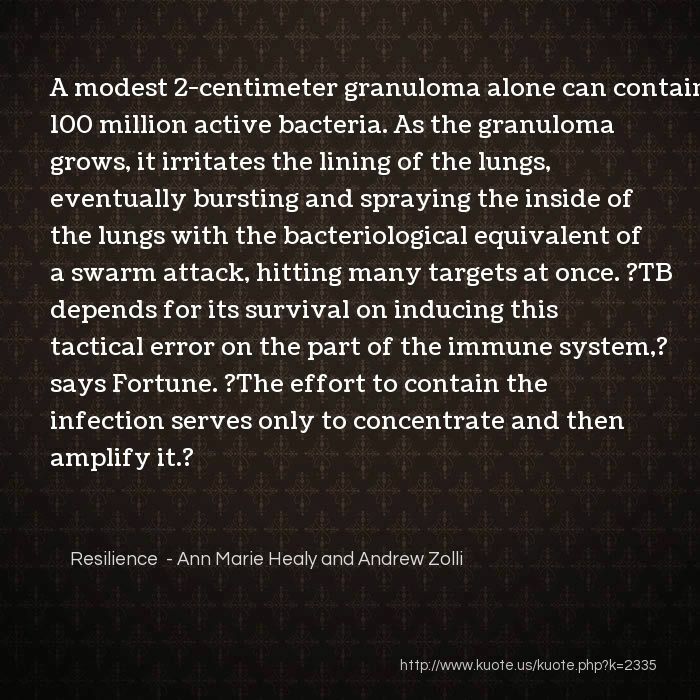 As the granuloma grows, it irritates the lining of the lungs, eventually bursting and spraying the inside of the lungs with the bacteriological equivalent of a swarm attack, hitting many targets at once. ?TB depends for its survival on inducing this tactical error on the part of the immune system,? says Fortune. ?The effort to contain the infection serves only to concentrate and then amplify it.? 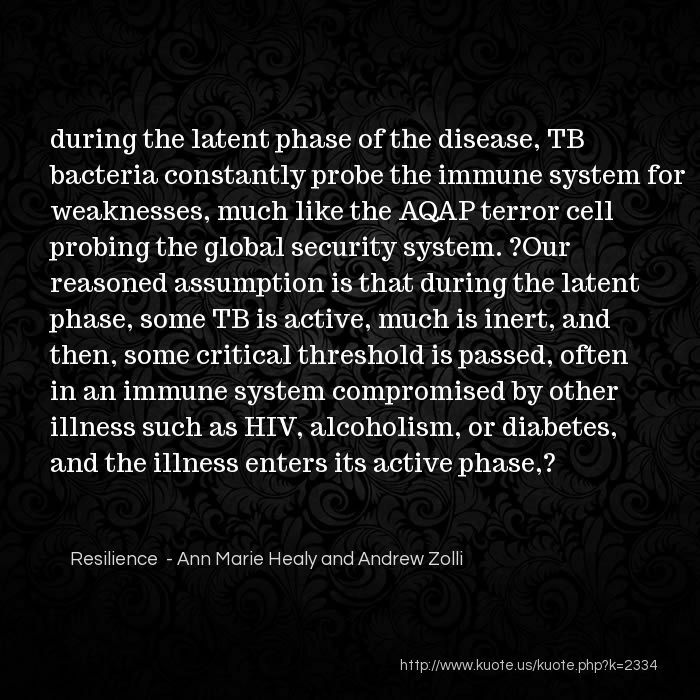 during the latent phase of the disease, TB bacteria constantly probe the immune system for weaknesses, much like the AQAP terror cell probing the global security system. 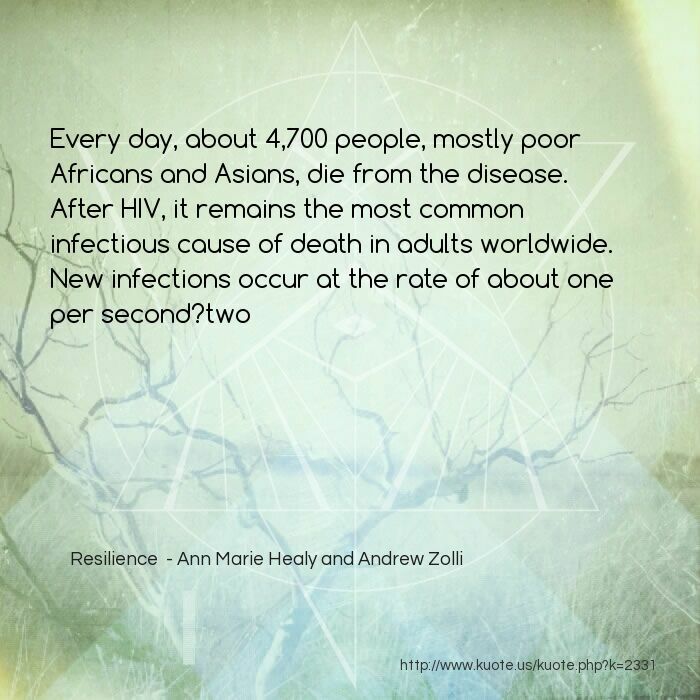 ?Our reasoned assumption is that during the latent phase, some TB is active, much is inert, and then, some critical threshold is passed, often in an immune system compromised by other illness such as HIV, alcoholism, or diabetes, and the illness enters its active phase,? 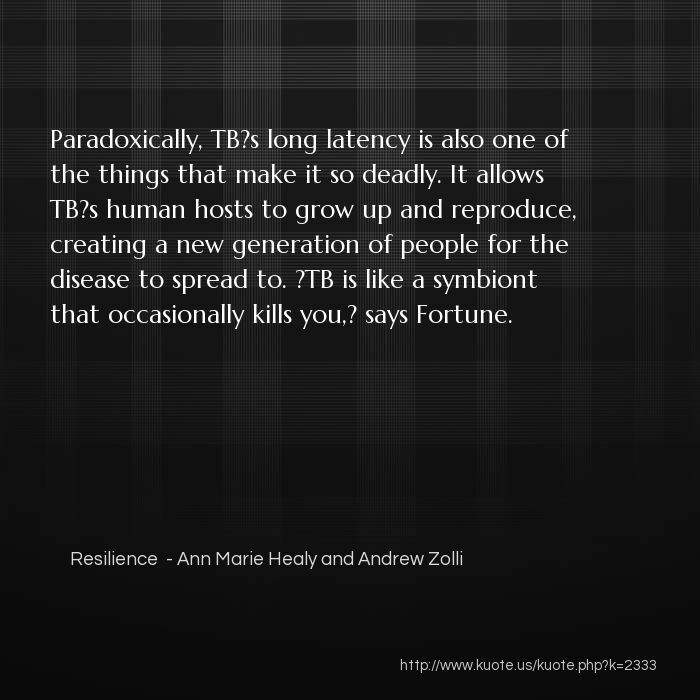 Paradoxically, TB?s long latency is also one of the things that make it so deadly. It allows TB?s human hosts to grow up and reproduce, creating a new generation of people for the disease to spread to. ?TB is like a symbiont that occasionally kills you,? says Fortune. When the TB bacteria arrive in the lung, they are met by macrophages (literally ?big eaters? ), the white blood cells at the front lines of the human immune system that are normally responsible for consuming and destroying invading pathogens. In certain cases, macrophages find this task difficult to do, so in a last, kamikaze-like move, they will engulf an unknown invader, coat it in the cellular equivalent of Saran Wrap, and then, on cue, promptly die, taking the pathogen with them. 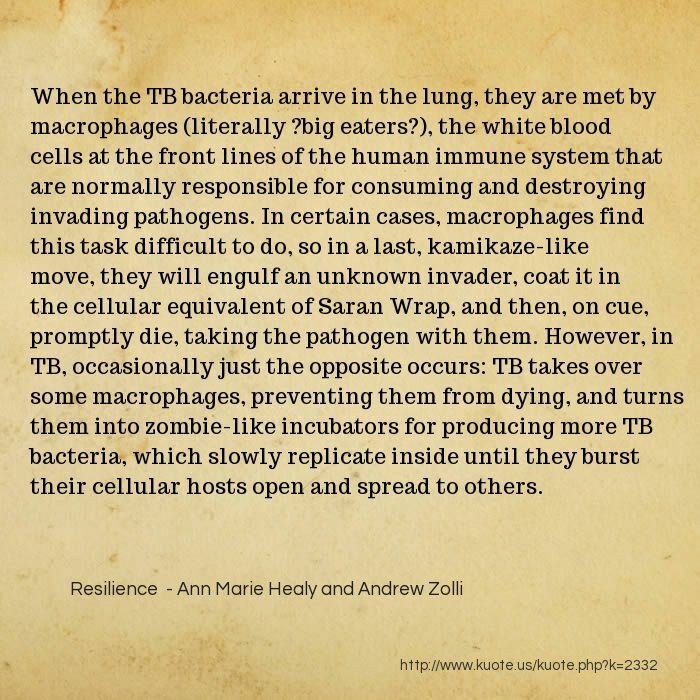 However, in TB, occasionally just the opposite occurs: TB takes over some macrophages, preventing them from dying, and turns them into zombie-like incubators for producing more TB bacteria, which slowly replicate inside until they burst their cellular hosts open and spread to others. 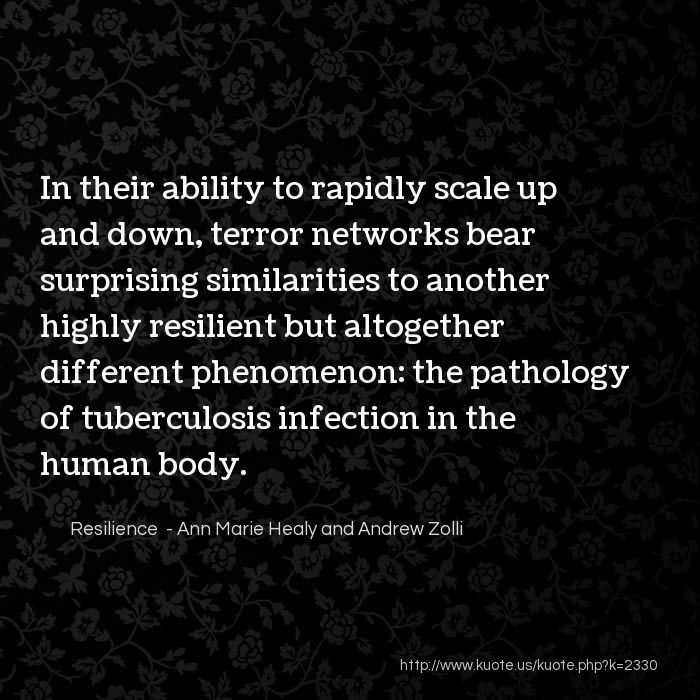 In their ability to rapidly scale up and down, terror networks bear surprising similarities to another highly resilient but altogether different phenomenon: the pathology of tuberculosis infection in the human body. 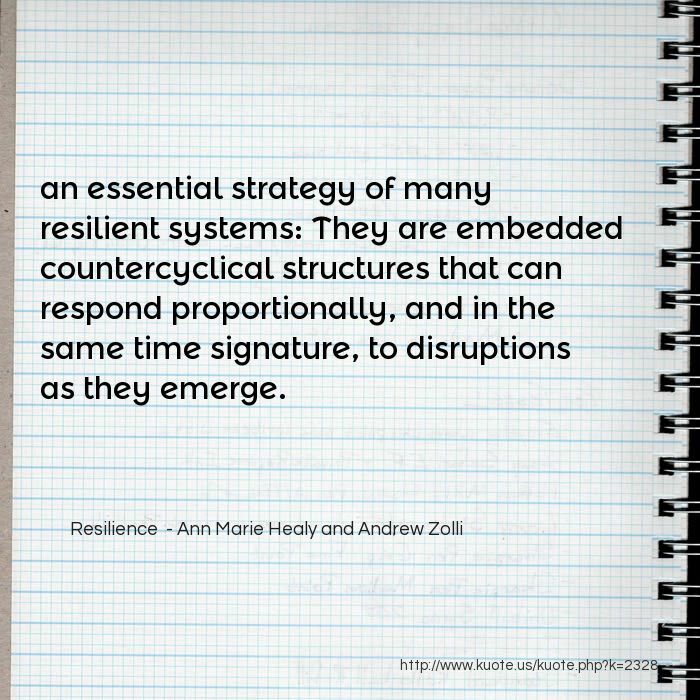 an essential strategy of many resilient systems: They are embedded countercyclical structures that can respond proportionally, and in the same time signature, to disruptions as they emerge. there has been a boom, business in national currency has boomed, and activity in the unofficial currency has dropped proportionally again. In the past, people have attributed the success of the Swiss economy to a national character of pragmatism and thrift. 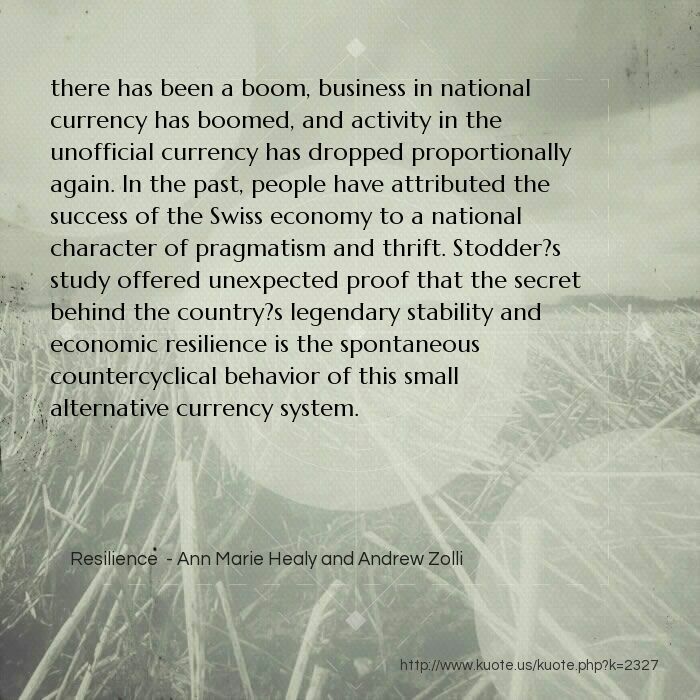 Stodder?s study offered unexpected proof that the secret behind the country?s legendary stability and economic resilience is the spontaneous countercyclical behavior of this small alternative currency system. In the midst of all this, sixteen businessmen decided to create a solution for themselves. 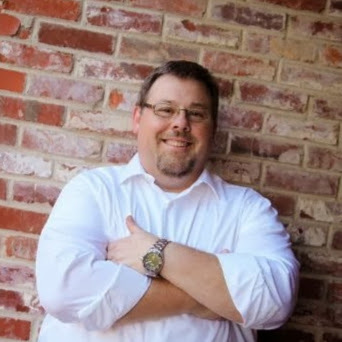 All of them, along with their clients, had been informed by their banks that their credit lines were no longer open to them; without credit, their businesses were positioned on the brink of bankruptcy. Rather than fail, they decided to set up a complementary form of currency. 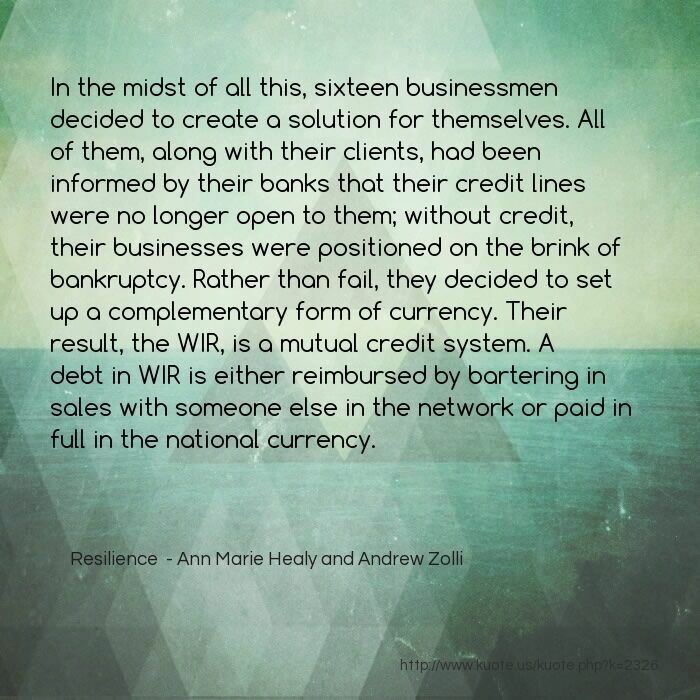 Their result, the WIR, is a mutual credit system. A debt in WIR is either reimbursed by bartering in sales with someone else in the network or paid in full in the national currency. WIR?Wirtschafstring, or ?circle? in German?began in the depths of the Great Depression. In the wake of the stock market crash of 1929, total world trade plummeted?by 20 percent in 1930, another 29 percent in 1931, and another 32 percent in 1932. Unemployment reached 30 million. Wealth that was once all but assured disappeared into thin air, and banks that seemed certain to stand suddenly collapsed, as stocks lost nearly 90 percent of their value. Switzerland was pulled into the crisis more slowly than some of the other European countries, and it was slower to recover. 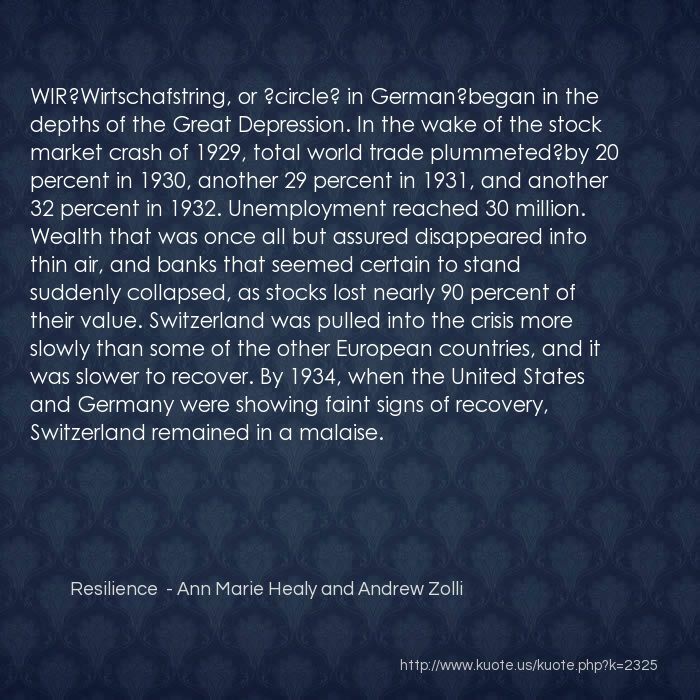 By 1934, when the United States and Germany were showing faint signs of recovery, Switzerland remained in a malaise.